or a fundamental thermodynamic equation like the steady flow energy equation. But fear not; given the constraints that our systems operate under, most of the things we need to evaluate allow us to make simplifying assumptions and substitutions that make the mathematics much more palatable. For instance, when applied to a mixed air plenum, the steady flow energy equation illustrated above can be reduced to a number of useful, relatively simple expressions, like the following. If you are curious about exactly how you get from the big equation to the little one, our blog post Economizers–The Physics of a Mixed Air Plenum illustrates just that. And the relationships are handy enough that we built them into a spreadsheet that we share in the resources section of the website. In this section of the website, we thought we would share some of the formulas we use the most in our day to day activities. For each formula, we provide a little discussion about what it is used for and what some of the constraints might be. And we also include a link to the formula as a .wmf file (Windows Meta File). The reason for providing the formula as a .wmf file is that it turns out most versions of Microsoft Office include a little application called Microsoft Equation 3.0. If nothing else, it will show up in what ever menu is used by the application to insert an object. 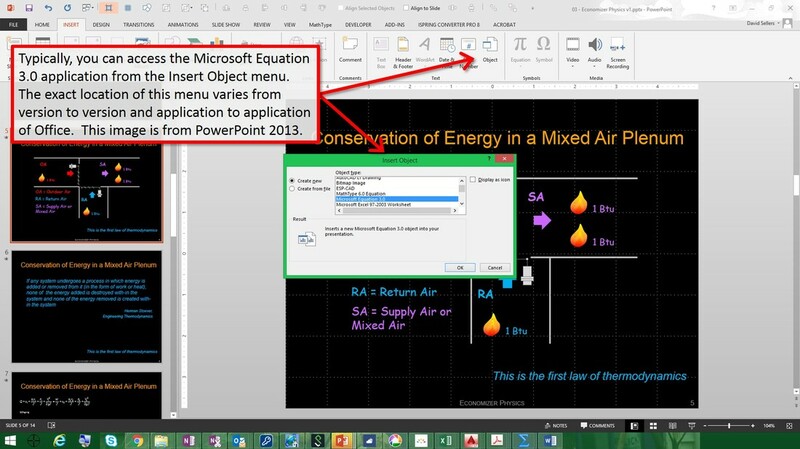 Here is what that looks like in PowerPoint 2013. So, you should be able to use our file as a starting point for editing the formula for your own use rather than starting from scratch. Our experience has been that using Microsoft Equation is a handy way to illustrate how you are going about doing a calculation in a presentation or document. And for spreadsheets, its just good practice to document how you came up with a result. It may be perfectly clear to you at the time, but sometimes, you can forget the brilliant trail your mind blazed to come to a conclusion after a while. Plus, if something were to happen to you, like you change positions, it is important that the person following in your footsteps be able to follow your thought process as well. In addition, in our experience, it seems to work better than the equation editor that currently is packaged with the Microsoft product line. You can see the menu option for that feature in the picture above just to the left of the "Object" menu feature we are pointing to with our red arrow (the grayed out box with the "pi" symbol in it). So the point is that Microsoft Equation 3.0 gives you a convenient way to document your formulas because it includes all the basic math symbols and then some. If you find yourself using it a lot, you may even want to consider upgrading to the professional version, which is called MathType. Doing that opens the door to a lot more features like the ability to save files, use colors, more fonts, etc. Virtually all of the equations that show up in our blog were generated using MathType. Just to be sure we are on the same page about all of this, Microsoft Equation 3.0 and MathType allow you to document formulas so you can insert them into your various work products. But you still have to do the math with a slide rule or a calculator or by creating a formula in Excel or by typing the formula in Notepad and hitting "Enter" (betcha might not have know about that feature of Notepad). Moving on, we anticipate this section of the website will always be growing, so check back if you are looking for a formula and don't find it; we plan to keep adding things as time permits. Or if you want, you can contact us and let us know what you are looking for. If its a formula we are familiar with but have not gotten around to sharing, we will try to move it to the top of the stack. As is the case for the other resource sections, what follows is a gallery with the various formulas in it. So, just scroll down to see what is available currently. This is a PowerPoint slide set I put together that has a lot of useful HVAC Principles, concepts, and equations in it. Eventually, I plan to make a separate page for each of the equations similar to the ones I made when I set up this site initially, like the Pump Power and Energy page or the Square Law page. But for the time being, this will provide access to the equations, but with less information about how to apply them.